Compact Pneumatic twist cylinders are linear motion compact cylinders with an internal cam that provides 90 deg swing motion. 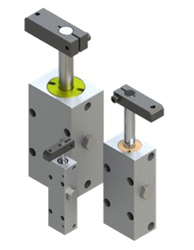 Twist cylinders are ideal swing clamps for automated and semi automated assembly and work holding found in circuit board assemblies, medical devices, robotic cells, component assembly and other applications. Because of their compact size and versatile mounting, they also make unique conveyor stops, diverters and escapements. Our online selection tools make it easy to select the product you need.